Vinegar is a pungent liquid made by the fermentation of sugars into alcohol which is subsequently fermented again. Vinegar can be made from a range of foods which has a direct effect on the type of vinegar produced. Vinegars should have a good, clean, sharp flavor for their type. The strength of acidity determines the tartness of the vinegar and how it can be used in cooking. Vinegar that is very strong should first be diluted with water before it is measured for a recipe. The most popular vinegars include Cider vinegar, White or distilled vinegar, Wine vinegar, Flavored vinegars, Sherry vinegar, Balsamic vinegar, Malt vinegar and Rice vinegar. White or distilled vinegar is used when a neutral flavor is desired for a salad dressing while other vinegars are used for their characteristic flavors. Wine vinegars are often used to make high quality oil and vinegar dressing. In India, vinegar is known as Sirka. It is used in masalas, mutton mirch, egg pickles, and other dishes. It's also used as a substitute for yogurt to add an acidic component in marinades. 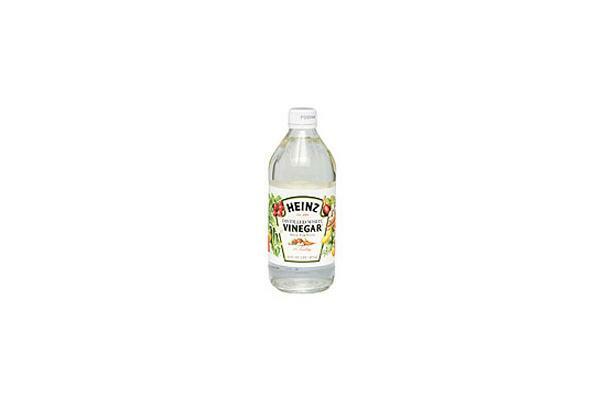 The uses for vinegar are endless as it can be used widely in cooking and cleaning. The health benefits of vinegar are also well documented. White acidic liquid that contains strong stingy scent when smelled near the nose. Choosing: When purchasing vinegar, keep in mind that you often get what you pay for. Some "cider flavored" vinegars are really just cheap distilled white vinegar to which coloring and additional flavors have been added. Use vinegar as flavor, condiments. Depending on the recipe, use just correct amount of vinegar. Cleaning: It's not necessary to clean vinegar, however vinegar can be used as a cleaner. Mixing it with water, it's ideal for cleaning windows, floors and countetops. Most vinegars are tasteless after a year of sitting opened. Vinegar's flavor can be preserved if it is stored in a cool dark place or in a refrigerator. Some vinegars, if stored improperly or too long, will develop a cloudy look. This cloudy substance (called "mother of vinegar" since it can be used to make more vinegar) can be filtered out with a paper coffee filter in order to salvage the vinegar. However, if either the mother or the vinegar smells bad or rotten, discard both immediately. Hippocrates (referred to often as the father of medicine) extolled the healing properties of vinegar. Cleopatra won a bet that she could consume a fortune in one meal. She disolved some pearls in vinegar and drank them. Hannibal used vinegar to make his way over the Alps in his conquest of Europe. He disolved huge bolders by heating the rocks then pouring hot vinegar over them. They crumbled and he could then get through with his army that rode on elephants. Vinegar became so popular that for the most part it was commercially produced as early as 2000 BC. History: There was no need to invent vinegar as it invents itself. Any liquid that has sugar in it automatically turns to vinegar when exposed to air. The Babalonians used it to preserve foods and as a seasoning for their food. We have record of the Greek using it to preserve foods and Roman soldiers made a beverage used as they traveled. Not much has changed with our use of vinegar, we still use it to preserve foods and season with. The name comes from the simple compounding of 2 words by the French and probably not uttered pleasantly. When a cask of wine got a crack in it and became exposed to air they most likely uttered ......vin ..aiger ....which means ..sour wine.